Victories have been in very short supply for both the Cobblers and Coventry City in recent months, so much so that Saturday’s Sixfields showdown between the pair falls into the ‘must-win’ category for both teams. In the claret corner we have the Cobblers, who have won just two their past 12 matches in Sky Bet League One to slip into a relegation battle. They are without a league win on home soil since beating Bury 3-2 way back on October 29. It adds up to a haul of six points out of the past 36 available to them. In the Sky Blue corner we have Coventry, who haven’t won any of their past 11 league games, drawing just two. They are without a league win of any description since seeing off Chesterfield 2-0 at the Ricoh Arena on November 1, and haven’t won on their travels since beating Port Vale 2-0 on October 1. That adds up to a pitiful haul of two points out of the past 33 on the table. It all means Russell Slade’s men are the one team in league one in worse form that the Cobblers, so if ever there was an ideal chance for Town to get themselves back on the winning trail it is surely this weekend. But that isn’t a theory that new Cobblers boss Justin Edinburgh necessarily agrees with, as he said: “The script doesn’t always go to plan does it? “Russell has gone in there, and is putting his own stamp on to Coventry and they will be a tough team to play against. “They are not being beaten by much, they are always in games, so we have to be mindful of that. When these two sides met at the Ricoh back in August, the home team played well as they battled back from 1-0 down to claim a 1-1 draw, and to many observers it is a surprise to see them four points adrift at the bottom of the table. Results obviously don’t lie though, which is why they are where they are, but Edinburgh added: “Coventry’s position shows just how open this league is. “We know about their off-field troubles, but in terms of being a competitive team that is what they are. “I really wouldn’t want people to sit down in their seats and expect us to win 3-0 or 4-0, I don’t think that’s the case in any game in this league this season. 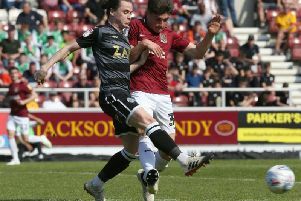 If the Cobblers are going to get anything out of Saturday’s game they are going have to defend better than they did in last weekend’s 5-3 defeat at Milton Keynes Dons, and that is what Edinburgh and the players are working on. “We debriefed the players on Monday, and we had to iron out a few problems and be honest with one another,” said the Cobblers boss, who is still hoping to sign at least one player before Saturday. “We made errors that are completely avoidable, we have looked at that, we have worked on it, and we will continue to do that because we have to be harder to play against. We have to be more aggressive in our defending. “They are a good group, they are responsive, their work ethic is good, and we are working hard to eradicate errors, and there were a lot of basic errors on Saturday which we know are avoidable. So will there be wholesale changes? Or will those who played last weekend be given another chance? “You have to try and get some continuity and to give people opportunities,” said Edinburgh. “We have spoken about it, and talking has to be done, but actions have to be delivered.